i'm reporting a bug and a player by the way who was mad then he decided to spam the chat. The problem was that the game was impossible to play because of the chat spam. Mayeb can you add a limit on number of messages send and the length of 1 message, or something like that ? 200 characters per message will be enough? max number of messages per round? 50? max number of messages in 10 seconds? 3? I agree. If ppl wanna chat (me included as I'm a culprit of a in-game chat here and there); there's a discord for that. especially if they have mics. no need to inundate the servers! If they need to go over in round limit; they can move to the discord. I'd suggest - 100 characters per message, 3 seconds wait time per each message and a system that doesn't allow you to send the same message repeatedly (like minecraft's system, to avoid flooding). Also, if you send five (or ten, at most) messages then you shouldn't be able to send another until someone else sends one (the message wouldn't appear on chat and there would be no way of alerting that the message wasn't sent.. this is good for avoiding spammers). 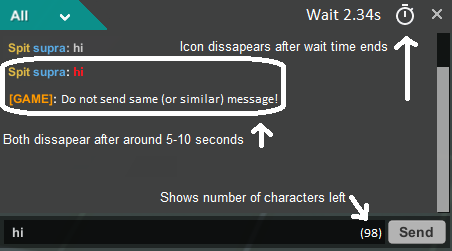 I think this would be the best option for our chat and we'd see much less spam. If people don't like how it works, they can go to discord for chatting (as litenite said). There must be restrictions, but normal user shouldn't notice these restrictions, so i will not show any timers, or character limits. Limits must be set so high that normal user will never reach them. 200 characters is not a lot and not a problem. Is it possible that someone will answer 2 times in the row with "yes", or "no"? I think highly possible. Ok, i will add 5 message in the row limit. As long as you don't post the same message twice in a row, you won't get the message saying "Do not post same message"
And disable resctrictions for admins no ? MrTitix you think you can exceed any of these limits? and i will increase this limit. As i wrote, normal user shouldn't even notice any limits. When we explain something to someone. I mean it's not like forums where you have time to write.